A Most Peculiar Sunset : Krulwich Wonders... Think about the sunsets you've seen. Often the sky turns golden, orange or sometimes pink and red. But on Mars, the sunsets are blue. Why? You wouldn't know it, not right away, but there is something strange about this picture. It's a sunset, yes, but notice the blush of color right above the sun. It's blue. And as you look up, the blue fades into a faint rose or pink. Now think about the sunsets you've seen, how often the sky can turn golden, or orange, sometimes pink, red, but when you look up, away from the setting sun, those colors fade back to a pale, twilight blue? It's rare to see a sunset dipped in blue. So this photo is a puzzle: it's blue where the red should be and red where the blue should be. Why? Because we're not on Earth. This is a Martian sunset. On May 19, 2005, the camera on NASA's little robot, the rover named Spirit, took this picture while sitting in the Gusev crater on Mars. NASA snapped the photo, says the press release, "around 6:07 in the evening of the Rover's 489th Martian day." Apparently, Mars has blue sunsets all the time. Earth doesn't. NASA admits that there's a color filter on Spirit's camera that exaggerates the colors slightly, but they say the blues you see here "are similar to what a human would see" on Mars. Not so much the pinks. Pinks are slightly more pronounced in these photos, but the blues are true colors. 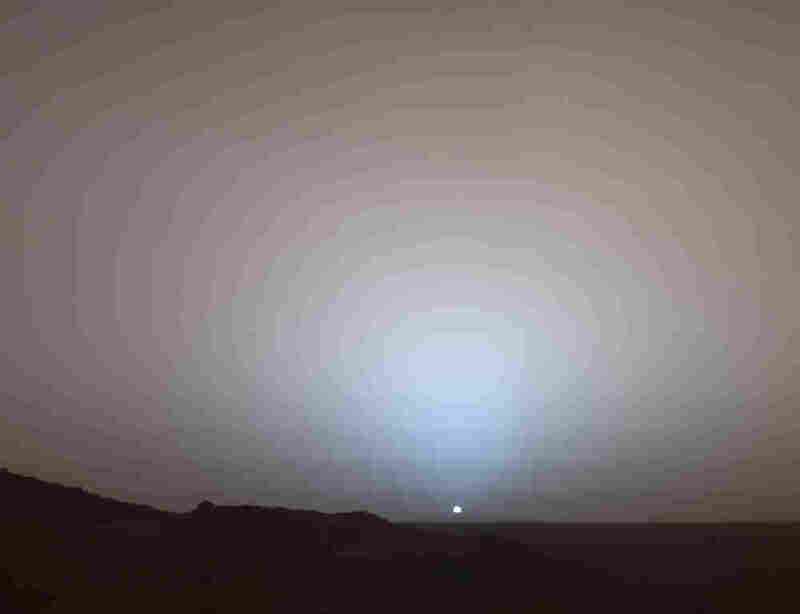 So here's our question: Why are Martian sunsets blue? On Earth, the air is mostly nitrogen and oxygen. We've also got moisture, dust particles, smoke, aerosols, pollen, salt from the ocean. The atmosphere on Earth is denser — meaning there are more molecules per cubic inch in our air. Martian air, by contrast, is much, much thinner, about 1percent the density of air on Earth, plus the gasses are different: they've got CO2, nitrogen and argon, but most important, says Mark Lemmon, associate professor of planetary sciences at Texas A&M University, air on Mars is rich with teeny, teeny particles of dust. Their dust is smaller than our dust, and they've got more of it in the Martian sky. Dust is the key to why the two sunsets look different, so we'll be keeping our eye on Martian dust. Let's stand facing the sun on Mars. It's early evening. The sun is setting. Light is streaming toward our eyes, moving through the dusty air. What happens? Sunshine, as you know, contains many different wavelengths of light. If you catch a beam of light in a prism (Newton did this) it breaks into a rainbow of colors — reds, violets, blues. 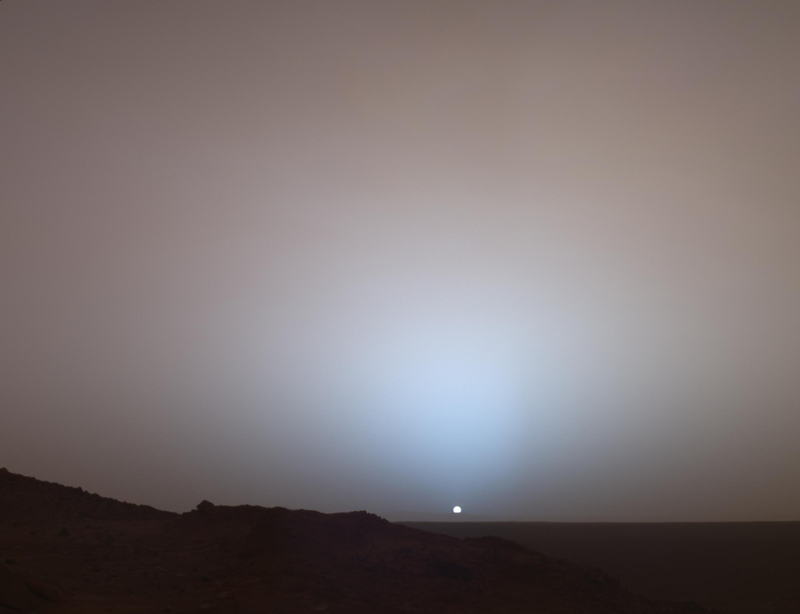 When the sunshine on Mars hits the clouds of fine dust floating through the air, it also breaks into different colors. Martian dust is exactly the right size to absorb the blue wavelengths of light and scatter red wavelengths all over the sky. That's why if you are standing on Mars and look away from the setting sun, most of the sky is rosy, pink, and various shades of red. But now look straight at the setting sun. On Mars, the beams of light streaming toward you, having lost their red waves, show the wavelengths that haven't scattered off. That remaining light is predominantly blue. 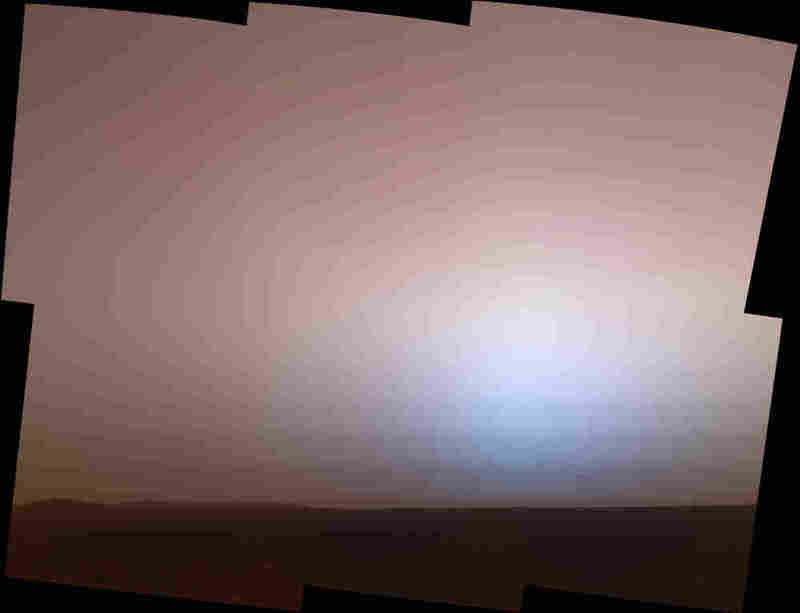 So when you look straight at the sun on Mars, you see a haze of blue. Look away from the sun, and the light is red. It's exactly the opposite on Earth. Here, when the sunshine hits our atmosphere, the waves that scatter are blue in color. 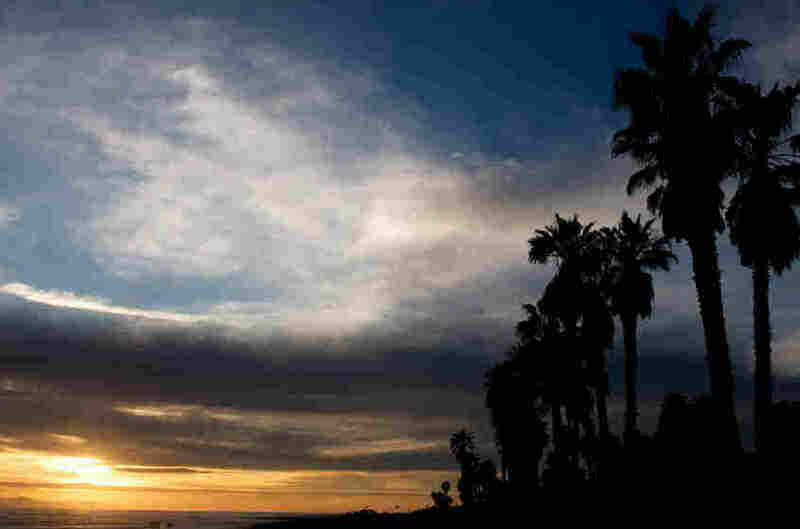 That's why everywhere we look, our sky is blue — except when we look straight at the setting sun. There, the blue light is missing, so the remaining wavelengths predominate, and they are mostly the reds, the golds, the oranges. Our atmosphere scatters blue; Mars' atmosphere scatters red. Our sunsets feature reds. Mars' sunsets feature blue. That's because our air is different from Martian air. What About That Blue Halo Around The Sun? Take a look at this short animation from NASA. Called "I'm Dreaming of A Blue Sunset," It's a reconstruction from still photographs, where you can see a bright blue halo around the sun as it sinks to the horizon. Why is that halo there? According to Professor Lemmon, when sunshine hits Martian dust, the blue light doesn't bounce far. It sticks near the dust, pingponging around at close range. That's why if there's a dust storm on the horizon, (and that's what seems to be happening in the video), the area around the sun traps a lot of blue light, and the sun seems to glow blue. Red light, as we've said, ricochets much farther off, so in the video, the reddish patches are some distance from the sun, the blue is tucked in close.